Arriving to Bulgaria from within Europe is simple thanks to the number of growing low cost airlines offering cheap and frequent flights to Bulgaria now. You can fly there from most European capitals, using national or legacy airlines which fly into the country's main gateway, Sofia. The national airline is Bulgaria Air, which flies from domestic destinations within Bulgaria to Sofia and onwards to many European capitals. Alternatively you can take low cost airlines like Easyjet, Wizzair  or Ryanair. If coming outside Europe, there are very limited direct connections. So a transit stop will be required in some major European city normally. By train you can reach Sofia from neighbouring counties.Cities like Belgrade, Istanbul, Bucharest, Athens, Ljubljana, or Vienna have direct services to Sofia. Within the country, public transportation is somewhat still old fashioned when compared to other cities. However since Bulgaria is now part of the European Union it's improving its transport infrastructure. Sofia has a good and reliable public transport system, however, the rest of the country can offer limited services when in smaller cities. Travelling domestically you will find plenty of busses and trains linking other cities. It's not expensive to travel by them and tickets can always be bought on the day of departure costing the same as bought in advance. Bulgaria has continental weather which brings hot summer's and very cold winter's (often snow). The appeal is double, as many travellers opt for Winter to ski in the nearby mountains,  which have the benefit of being much cheaper then other ski resorts like France or Switzerland.In winter temperatures can drop to -5 in the mountains, but +3 on the planes. On the opposite side Summer's are very enjoyable with temperatures reaching the high 30's and plenty of blue sky. For tourism in the country, culture and nature it's probably best to visit Bulgaria from April to September. Taking in mind that the months of July and August are more expensive. If you want to visit for Winter sports then the best time is January. Dinner is a social occasion, with traditional music and dancing in many restaurants, especially in resorts and in some Sofia eateries. Food is hearty and good. Meals usually start with a salad, from which there are many to choose from on the menu. There is a wide variety of national dishes, as well as Western European standard dishes. There are many attractive folk-style restaurants and cafés throughout the country. Specialities include: Tarator , cold soup made from cucumber, walnuts and yoghurt. Shopska salata, huge salad starter with tomatoes, cucumbers, peppers and white cheese. Kavarma ,individual casseroles of pork or veal, onions and mushrooms. Surmi, stuffed vine or cabbage leaves stuffed with meat. Kebapche, small, strongly spiced, minced meat rolls. As for drinks: Coffee is very popular, specially served espresso style. Infusions, made from herbs and dried leaves, particularly lime. White wines include Evksinograde, Karlouski Misket and Tamianka. Heavy red wines include Mavroud and Trakia. As for liquors, mastika (aniseed spirit, usually diluted) and rakia (local brandy) are local favourites. I discovered Bulgaria from a tour around other countries within the region and was pleased not to have missed out on it. The country is not the most advertised in Europe, however there are lots of positive things about my visit to Sofia. The people are hospitable, friendly and welcome visitors, I was pleased to see people smiling, and a general sense of good customer service. Sofia is a very cultural city where you can explore by foot it's hidden wonders. Many people make Sofia a transit stop on their way to Turkey or other Balkan countries around the area. Also it attracts a large number of skiers, which at the season I went, after skiing then flocked to restaurants and bars in the city where there is a young loud atmosphere. It's definitely a place to visit year round and it won't disappoint you. Sofia is Bulgaria’s capital and its largest city. Sofia is located in the western part of the country. The city is located at a strategic crossroads. The route from Western Europe to Istanbul passes through Sofia via Belgrade and Skopje, then through Plovdiv to Turkey. Sofia is relatively close to the capitals of most Balkan countries: Ankara, Athens Belgrade, Bucharest, Zagreb, Ljubljana, Sarajevo, Skopje and Tirana. It's quite popular therefore to visit Sofia in combination of any of these mentioned. Sofia preserves many valuable monuments to its long and storied past. Visitors exploring the city’s streets can see remnants of The Eastern Gate from the days when Sofia was Serdika and Sredets, dating from the 2nd-4th centuries. The city offers a wide range of activities, from culture and history to night entertainment, restaurants and clubs. All ages will find the city appealing as it's easy to walk around the streets and transport is accessible and easy to get. Arriving to Sofia from the airport is easy. Sofia Metro Line 1 connects Sofia Airport to the city centre and provides direct connection from the airport to the large residential complexes in close proximity. The trip takes 18 min. There is also public busses (84 and 384) which connect to the city, depending where you go it might be a good option. You need to buy tickets at the airport terminal before boarding the service. Once in the city, Sofia is easy to walk around if you stay within the city centre. But if you need to get public transport, it's very handy and reasonable. 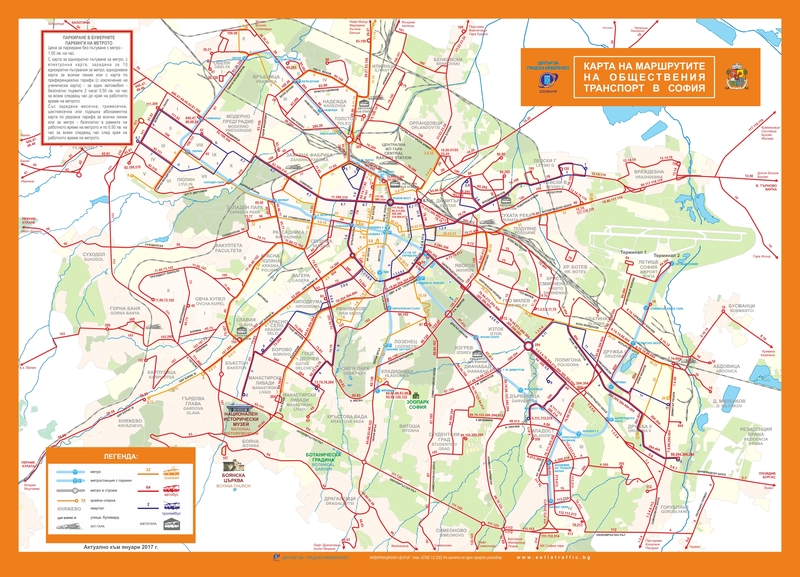 To download the below map follow this link: Sofia Transport Map. There is a a lot of culture to discover in Sofia, however, there is also scenery and nature and it's very popular as a sport's destination. Saint Sofia Basilica, founded during the reign of Justinian (reign 527-565), is one of the oldest churches in the capital. It was the city’s major church during the Middle Ages, and under the Ottomans it was used as a mosque. Very close to Saint Sofia is The Memorial Church Saint Alexander Nevsky, now one of the city’s most recognisable symbols. This church was built in 1912. Its bell tower rises to a height of 53 meters, and houses 53 bells, the heaviest weighing 10 tons. One of the most popular tourist destinations in Sofia, the church can hold roughly 5,000 people. The oldest church in Sofia is the Saint George Rotunda. It is thought that the church was built in the 6th century, during the reign of Constantine the Great. Also on the outskirts of the city, you can find the Boyana Church, a medieval Bulgarian Orthodox church. In 1979, the building was added to the UNESCO World Heritage List. There is hardly another city in all of Europe that has so many noteworthy Christian, Islamic, and Jewish monuments so close together. In the immediate vicinity, other historical remains are preserved, such as the municipal baths, the marketplace, and The Holy Sunday Church. Adjacent to this church is the Theological Seminary, which houses The National Historical and Archeological Museum. Other points of interest in the city include The Lion Bridge, The Eagle Bridge, The Russian Monument, The Ivan Vazov National Theatre, Banya Bashi Mosque, and the monument to Vasil Levski. On the lower slopes of Mount Vitosha, in the Boyana District, you will find the The National Museum of History, with its collection from prehistoric times to the present day. The museum has one of the largest collections anywhere, with over 700,000 items of cultural importance. Close to the museum is The Boyana Church, one of the Bulgarian monuments that is listed among the UNESCO World Heritage sites. Opportunities for sport and recreation  in the capital are many and varied, outdoor swimming pools, tennis courts, modern gymnasiums and sports halls, and parks. During the winter, the ski resort on Mount Vitosha  is a favorite with skiers and snowboarders alike, and during the summer it is a favourite place for hikers and picnickers. Mount Vitosha borders on The Vitosha Natural Park, which is the oldest nature reserve on the Balkan Peninsula. There are two ski centers on Mount Vitosha. There are a total of 29 km of ski runs on Vitosha, and the longest is 5 km. The maximum vertical drop is 780 meters. The slopes are suitable for both experienced skiers beginners. TIP: One of the best ways of discovering the city is by "free walking  tour". These tours are organised by locals or foreign students who study in the city and can show you around, explain key aspects of the city, architecture and culture and tell you curious things about it too. They are totally free and only require a donation at the end if you consider it worth it. It's a great way of meeting other travellers as well if you travel solo. For more info check this site: Sofia Walking tour. It's a very easy city to find all kinds of accommodation. From the high-end luxury hotels, to more budget hostels and even Airbnb is quite popular with local hosts taking up the idea more and more. The city is not expensive, however, there are plenty of normal Hotels which offer good prices and conveniently located. These hotels which are not part of any chains or big names, might be a little antique in regards to decoration and style. But it can be curious to stay here as it's like travelling back in time. Prices are from €25 per night per room within walking distance to the city. Sofia is safe, most Hotels have good security. However don't expose valuables or personal belongings at the hotel after leaving your room and lock your luggage just to be secure. Staying in Sofia is ideal for a short stay whilst you are visiting other cities or countries within the region. If you coming to ski then you might want to take a few more days but for general tourism in Sofia 3 nights would be enough.